Through their first two games of the 2018-19 season, the Tampa Bay Lightning are 1-1-0 with a close win on opening night against the Florida Panthers and an abysmal loss to the Vancouver Canucks on Oct. 11. While scoring never seemed to be an issue, it seems as though this year might be different. One of the issues here is the power play. The Lightning haven’t yet recorded a power play goal in the young season in eight opportunities. When you have players like Steven Stamkos, Nikita Kucherov and Brayden Point on the ice for a man advantage, you should be scoring fairly often with a man advantage. 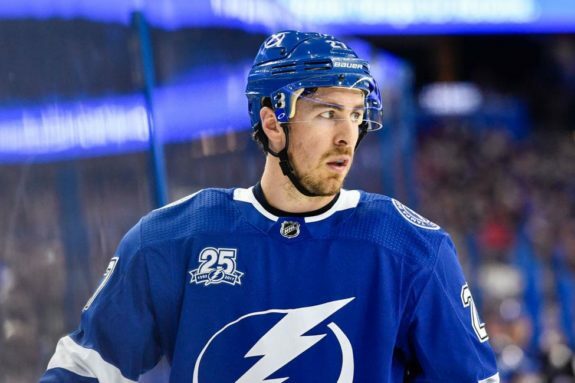 One reason they aren’t is that head coach Jon Cooper is experimenting with Ryan McDonagh quarterbacking the power play. 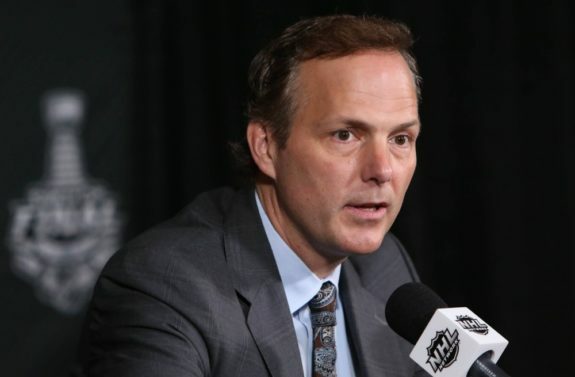 What Cooper needs to do is give Mikhail Sergachev a chance to lead the Lightning power play. Something Lightning fans found out last year is that Sergachev is a fluent skater who has the ability to activate on the rush. While there have been times this has cost him defensively, he can skate as well as the top defensemen in the league and command the puck. After Sergachev scored this goal against the Winnipeg Jets last season, I knew he would be a special player. What he would provide to the Lightning power play is a big body who has a commanding presence at the blue line, but also the ability to pass and shoot the puck when he has the opportunity. With a little more experience — which he can only get by playing on the power play — Sergachev will undoubtedly learn when to shoot or pass. Through nine NHL seasons, McDonagh has 10 goals and 51 points on the power play. In 16 games with the Lightning, he hasn’t registered a single point on the power play. This could be because of Victor Hedman’s strong play with a man advantage, but even on the second pair, McDonagh should still be on the score sheet more often. In his first full season, Sergachev registered 16 power play points (three goals, 13 assists), and as Sergachev continues to develop as a top-four NHL defenseman, those numbers should increase. That says a lot to Sergachev’s ability, but McDonagh has never had more than 15 points on the power play in a single season. He has also never had more than three goals on the man advantage. Sergachev might not be the most experienced guy, but he should be out there simply for his production. There are two reasons I believe Cooper is going with McDonagh on the second power play unit. First, McDonagh gets nearly half of his shots through to the net on the power play. On McDonagh’s unit is Mathieu Joseph, Yanni Gourde and Alex Killorn, three players who can clean up rebounds in front of the net. If you compare this to Sergachev, who has only gotten about 33 percent of his shots on the power play to the net, it’s logical to go with McDonagh. Second, McDonagh had 42 points in 2016-17 and 28 points in 2017-18. His 42 points were the second-highest total of his career, and his 28 points are just below his career average (29 points). Cooper must think he can get McDonagh back to that 40-point range by putting him on the power play. What doesn’t make sense is that Sergachev had 40 points in his first full NHL season, and he’s not on either power play unit. When Tampa Bay traded for McDonagh, they got a shutdown defenseman who would provide strong play in the defensive zone. What they didn’t get — and what they’re inexplicably using him for — is a strong presence on the power play who can command the blue line with a man advantage. Tampa Bay needs to start utilizing Sergachev’s strong skating and creativity to jumpstart the Lightning power play that can be one of the best in the league at its best.